San Andrés de Machaca, the largest village within the greater municipality of San Andrés de Machaca, is located in the Ingavi Province, 230 km from the city of La Paz in Bolivia’s Altiplano. According to the 2001 national census (Bolivia 2001), the municipality had a total population of 6,299 people, 96 per cent of whom identified as being ethnically Aymara, and 87 per cent of whom spoke Aymara as their primary language. Nearly all inhabitants of the municipality (98 per cent) were classified as living in poverty and 74 per cent were classified as living in extreme poverty (Bolivia 2001). The municipality contains several archaeological sites, including chullpas or pre-Conquest funerary towers, and a stone church known as el Templo de San Andrés de Machaca or la Iglesia de San Andrés de Machaca. Construction of the church began in 1806 and it was completed in 1833. The building project was directed by an Indigenous architect named Fancisco Coillo (de Mesa and Gisbert 1993: 146). The church was designated a National Monument via Supreme Decree No 06137, signed on 15 June 1962 (Bolivia 1962). Since being added to the National Monument list, the Templo de San Andrés de Machaca has been robbed numerous times, mostly during the past 15 years (Cuevas 2011). The village of San Andrés de Machaca has historically been too poor to secure the church properly. On Christmas Eve 1997, the Templo de San Andrés de Machaca was looted (Art Loss Register 2011). This was not the first time the church had been robbed, but details of previous robberies are unclear. More than 100 works of religious art were stolen on this occasion (BBC 2011). Among these were several 17th and 18th century religious paintings (Art Loss Register 2011). The church was robbed again in 2008 and forty-seven cultural objects were stolen (Caracol Radio 2008). Father Valerio Pacheco, priest of the Templo de San Andrés de Machaca, discovered the theft on the morning of 14 August. Among other items, two paintings (‘San Francisco de Paula’ and ‘Santísima Trinidad’), six sculptures of saints, a tabernacle, and thirty pieces of embossed silver (including incense braziers, a crucifix, a crown, and a heart with seven swords) were taken (Caracol Radio 2008). All of these items had been previously catalogued by the Bolivian Ministry of Cultures. A list bearing their measurements is housed on the website of the Secretary of Culture of Argentina, via Interpol. The church was robbed yet again in April 2010, but the thieves were caught within the week (see below). According to the Bolivian Ministry of Cultures, as of 2009 a total of 1,877 items have been stolen from the Templo de San Andrés de Machaca (Hannover 2010). In April 2010, three men were arrested in the Villa Remedios zone of El Alto, a sprawling satellite city on the high plain above La Paz. The city’s commander of police, Felix Segales, gave the names of those arrested as Mario Andrade Morales (it was later announced that this man was actually Edgar Quiroz Soliz), Felipe Perez Paco and Nicomedes Blanco Paco, all Bolivian nationals (Hannover 2010). The men were stopped by highway police on the road leading to the city of Oruro because of erratic driving and because the vehicle looked to be suspiciously filled with packages (Notas de Tourism en Bolivia 2010). Bolivia’s Fuerza Especial de Lucha Contra el Crimen (FELCC) recovered fifty-six cultural objects from the vehicle, all of which had been stolen from the Templo de San Andrés de Machaca (Hannover 2010). The pieces recovered included three 18th century religious paintings, two historic picture frames, a mirror, and twenty-six fragments of an altar decorated with gold leaf (Hannover 2010). Although it had been thought that these pieces were stolen in the 2008 church robbery, the objects recovered had not yet been reported stolen (Notas de Tourism en Bolivia 2010). A technical committee from the Ministry of Cultures visited the church and verified the theft, which they determined had occurred at some point during the same week as the arrests (Notas de Tourism en Bolivia 2010). Segales stated that the men arrested in El Alto planned to smuggle the objects into Peru (Hannover 2010). In October 2010, Felipe Pérez Paco and Édgar Quiroz Soliz were convicted of the theft of objects from the church at San Andres de Machaca and sentenced to four and a half years in prison (La Razón 2010). Proceedings against Nicómedes Blanco Paco were suspended temporarily (La Razón 2010), but was convicted of the crime several days later. In May 2011, a Washington-based art dealer consulted the Art Loss Register with questions about the provenance of two colonial period Bolivian paintings that he was handling for an American collector (BBC 2011). These paintings were, according to some accounts, about to be consigned for auction in London (Cuevas 2011). 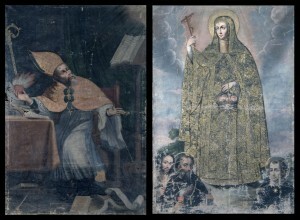 Researchers were able to positively identify the two paintings as portraits of Santa Rosa de Viterbo1 and San Agustín which had been stolen from San Andrés de Machaca during the 1997 robbery (BBC 2011). On 12 September 2011, the paintings were returned to the Bolivian Embassy in London (Art Loss Register 2011). After being restored, the paintings are to be returned to the Templo de San Andrés de Machaca (Cuevas 2011). To help support this return, the mayor of the municipality, Macario Mamani Mamani, requested government funding for the restoration of the church (Cuevas 2011). The final designs for this project were delivered to Mamani in March 2012. The plan aspires to promote cultural tourism development for the municipality (Ministerio de Culturas de Bolivia 2012). The paintings were made by unnamed local artists. They were painted on reused canvas from European packing bales mounted on wooden racks (Cuevas 2011). Lupe Meneses, the director of cataloguing with the Bolivian Ministry of Cultures, has emphasised the importance of these works, stating that they were developed by Indigenous people at a significant time in Bolivian history which allows for the possibility of different interpretations of the artwork (Cuevas 2011). Art Loss Register (2011), ‘The Art Loss Register Recovers Two Seventeenth Century Colonial Paintings Stolen from a Church in Bolivia,’ Press Release, 20 September. BBC (2011), ‘Bolivia recovers two paintings stolen from church’, BBC News, 19 September. http://www.bbc.co.uk/news/world-latin-america-14977757, accessed on 22 August 2012. Bolivia, Estado Plurinacional de (2001), ‘San Andres de Machaca’, Instituto Nacional de Estadística. http://www.ine.gob.bo/publicaciones/visorPdf.aspx?Codigo=020805&tipo=1, accessed 22 August 2012. Bolivia, Republica de (1962), Decreto Supremo No 06137. Caracol Radio (2008), ‘Roban 47 obras de arte de San Andrés de Machaca’, Caracol Radio, 21 August. http://www.caracol.com.co/noticias/roban-47-obras-de-arte-de-san-andres-de-machaca/20080821/nota/655739.aspx, accessed 22 August 2012. Cuevas, Aleja (2011), ‘Lienzos rescatados están bajo resguardo’, La Prensa, 8 September. http://www.laprensa.com.bo/diario/entretendencias/cultura/20111008/lienzos-rescatados-estan-bajo-resguardo_8652_14551.html, accessed 22 August 2012.
de Mesa, José and Teresa Gisbert (1993), ‘Pervivencia del Estilo Veirreinal en la Pintura Boliviana del Siglo XIX’, Laboratorio de Arte, 5, 143-157. Hannover, Carla (2010), ‘La FELCC recupera más de 50 piezas patrimoniales’, La Razón, 20 April. http://www2.la-razon.com/version.php?ArticleId=897&EditionId=59, accessed 22 August 2012. La Razón (2010), ‘Condenan a ladrones de arte de Machaca’, La Razón, 30 October. Ministerio de Culturas de Bolivia (2012), ‘San Andrés de Machaca: Templo patrimonial será refaccionado con apoyo del Ministerio de Culturas’, Press Release, 30 March. http://www.minculturas.gob.bo/index.php?option=com_content&view=article&id=1681:san-andres-de-machaca-templo-patrimonial-sera-refaccionado-con-apoyo-del-ministerio-de-culturas-&catid=71:prensa&Itemid=458, accessed 22 August 2012. Notas de Tourism en Bolivia (2010), ‘Cae una banda que traficaba piezas de patrimonio cultural’, Blog: Notas de Tourism en Bolivia ,30 April, http://www.boliviaviajes.org/2010/04/cae-una-banda-que-traficaba-piezas-de.html, accessed 22 August 2012. 1. The painting was catalogued as Santa Rita de Viterbo by researchers from the Universidad Mayor de San Andrés (La Paz) in 1974, but subsequent research indicates it may actually depict Santa Rita de Cascia (Cueava 2011).